“We’re used to thinking of design as being a visual process. But really, design is an intellectual process, and the visual dimension is a tool to aid in that. 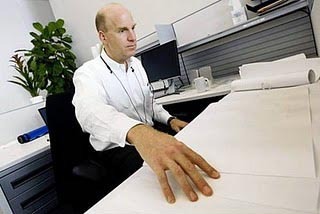 It’s one way of getting information, but it’s not the only way.” Downey found several methods that he could use to to create new designs and to communicate with other members of the design team, including physical models, drawing kits with raised lines, and special 3D printers that print drawings in a raised form, like Braille. “The rest of the team creates a PDF file, and I can print that file on the embossing printer without special software. Revit even lets you load in a Braille font to get labels on drawings, without requiring that the rest of the team know Braille.” To convert computer screen information into audio form, Downey uses a product from Freedom Scientific called Jaws. This bias towards the visual occurs in other fields besides architecture. “Professions such as math, science, and engineering are also commonly thought to be out of reach for people without vision,” said Downey. The stereotype of a “trade school” that saw blind people as only fit for simple trades such as basket-weaving comes to mind, but a brief perusal of the Perkins School for the Blind History Museum site reveals that with the right encouragement, blind people have been able to participate in a variety of activities – including team sports and professional careers. 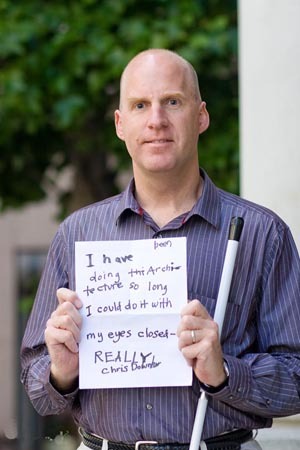 Architect Chris Downey worked with SmithGroup and the Design Partnership on the design of the VA Polytrauma Center in Palo Alto, California, after losing his own eyesight. Image courtesy of SmithGroup. He’s consulted on the renovation of the Associated Blind Housing in NY, a 220-unit development, and is also exploring some potential work for Guide Dogs for the Blind in San Rafael. New projects include an eye clinic for Duke University (together with HOK) in Durham, NC, and projects for other service providers for the visually impaired. Facilities for visually impaired people include such things as rehabilitation centers, yoga centers, storefronts, summer camps, and self-defense. “What is an appropriate visitor experience for someone who isn’t completely blind, but who still has impaired vision?” he asked. Considering that up to 20% of us may lose some vision as we get older, the implications are that we all might need additional cues at some time or another in order to maintain our navigation skills. Beyond that, Downey’s interest is not limited solely to work for the visually impaired. “Many places benefit from a multisensory experience: playgrounds for example, are physically dynamic and socially interactive.” By paying greater attention to all the senses, environments can be more enjoyable and stimulating without becoming more stressful. If Chris Downey ever wanted to quit being a blind architect, he could be a comedian. This photo by Tony Diefell shows Downey with a sign saying "I have been doing architecture for so long I could do it with my eyes closed - REALLY." How Many Blind People Are Out There, Anyway? With some conditions, glare can interfere with vision far beyond what most of us would experience. The American Optometric Association defines blindness in specific functional terms: anyone with vision worse than 20/200 in their “better” eye, that cannot be improved with corrective lenses, is considered legally blind. In addition, people with a central visual field of less than 20 degrees diameter (a 10-degree radius) are also considered legally blind. The leading causes of blindness in the U.S. are accidents, diabetes, glaucoma, and macular degeneration. Although vision loss can happen at any age, vision impairment is disproportionately found in older people; according to the Braille Institute, 70% of severely visually impaired persons are age 65 or older. Not only is the problem widespread, but consider also that dedicated centers and schools aren’t the only areas that are used by people with visual impairments. Other areas that are especially problematic for visually impaired people include transit centers, public buildings, cafes, and even supposedly “pedestrian-friendly” sidewalks. 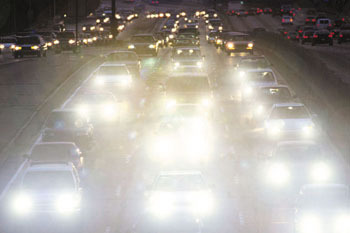 People who are legally blind can’t drive, and thus are more dependent on alternative methods of travel. These typically include mass transit, other people, or their own feet. Orientation mobility was the term used to assess how to do things like find the turnstile, find the right platform and the right train, board the train, recognize the stop, get off the train, find the desired exit from the station, and so forth. In poorly designed transit centers, even people with perfect vision can have trouble figuring it all out, especially if they’re not familiar with the area. 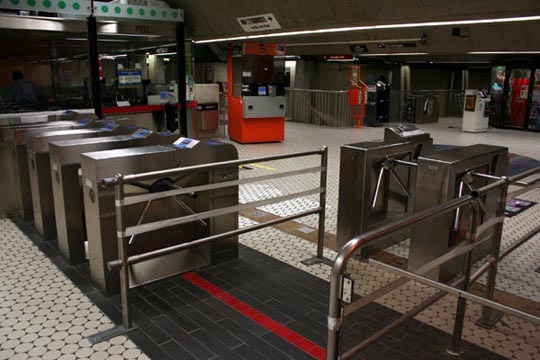 Transit stations are an area where it's especially important to make features like turnstiles easy to find for vision-impaired individuals who depend on public transportation to get around. In 2006, the Department of Justice had a lawsuit regarding the accessibility of the International Spy Museum. “Just being able to walk around doesn’t equal accessibility. Accessibility of content is as important as physical accessibility. What is the visitor experience if you can’t see?” In fact, accessibility is a lot more than wheelchairs, because people can have different disabilities. Once Downey started to lay it all out, a lot of it seemed like common sense, like the fact that people with poor vision use other senses to compensate. To be more user-friendly, buildings and environments should speak to senses other than vision, to make places more recognizable for a wider spectrum of abilities. Integrated holistic architecture was the term Downey used to describe this approach. Scented plants such as rose, mint, or angel's trumpets can help create a sensory-rich experience for people who can't see. And so we forget about other sensory dimensions until the building is built. By that point, it’s a bit late in the day to correct for fundamental design flaws such as poor acoustics. We typically just grit our teeth and pretend that we like it. 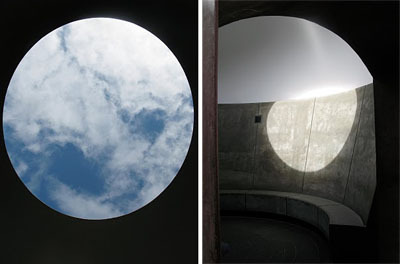 The Sky Dome by James Turrell, at the De Young Museum in San Francisco, is a fascinating acoustical experience regardless of whether you can see or not. 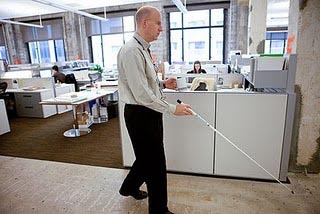 Does the Americans with Disabilities Act Help the Blind? Walls that tilt inwards may be a Modernist dream at places like the Contemporary Jewish Museum, but they’re equally bad for blind people for the same reason. The top of such a wall can smack into someone’s head well before the sweep of the cane could detect the bottom of the wall. This condition might also be referred to as “bad feng shui” because sharp angles and visual obstacles “cut the chi” and in this case they can cut your head, too. Walls that tilt inward can be hazardous to blind people, because their head will connect with the wall before their cane can detect it. The type of stair shown on the left, while less "design-ey", would allow a blind person with a cane to detect it from the side. The one on the right would not reveal itself to a cane sweep at floor level, creating a hazardous condition. Seismic braces are a good example of replacing one hazard with another. A diagonal brace located in an awkward part of a room can be an obstacle even for sighted people. Downey showed several examples from local eateries (we won’t name them here because sometimes you really don’t have a choice of whether or not to use a brace, and sometimes there’s no leeway on placement, either). There was another brace at the Chicago Navy Pier Convention Center which seemed almost intentionally designed as a booby trap. Stairs can be nerve-wracking, even if they’ve got plenty of handrails. Downey showed a few photos of what he termed “wedding-cake stairs” at an office building in San Francisco’s Financial District, and at a local middle school. These are stairs with a scalloped or zigzag footprint that can make it hard for a blind person to detect when they have reached the top of the landing. 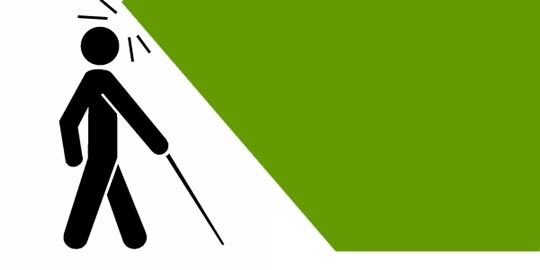 Tiered stairways that bend or curve around can be hard for blind people to navigate, because they can mistake a corner for a landing. Clockwise from top left, first is a typical straight stair with a railing in the middle. 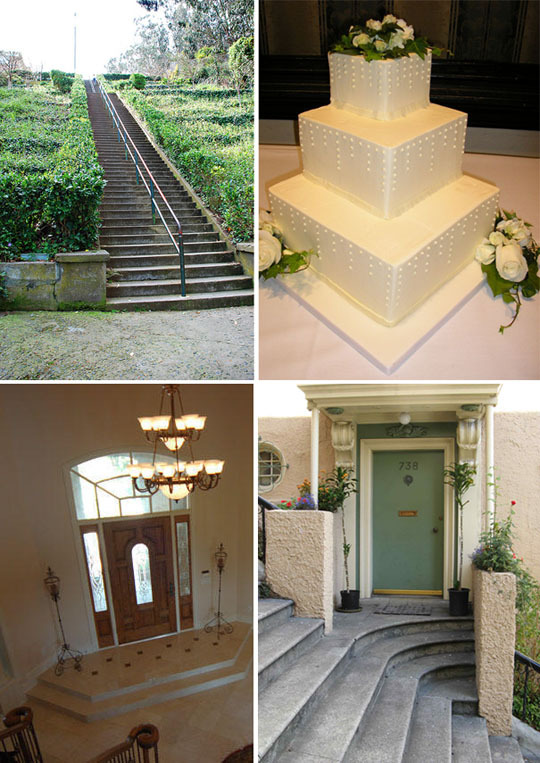 Top right shows an actual wedding cake with a corner "stair". Lower left shows an irregular tiered platform in a home by the front entry. Lower right shows a reverse wedding-cake stair. A lot of these conditions were well-intentioned ideas with unintended consequences, like the seismic braces. One surprising example of this was an attractive brick-paved street without curbs that was shared by vehicles and pedestrians, on either side of a painted line. This is challenging for blind people, who rely on being able to feel the curb and the level change from sidewalk to street to know which is which. A painted line doesn’t help them. So, what sort of features actually work for visually impaired people? Downey listed several areas of concern and discussed the trial-and-error method of discovering solutions. With wheelchair-bound people, the problem isn’t knowing where to go, it’s getting there. 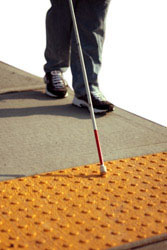 For the visually impaired, however, finding their way is a major concern. What about tactile maps? someone asked during the talk. “They tried that in MUNI for a while but it wasn’t a success. First you have to FIND the map, and who wants to touch all those walls?” Good point… a person could go through a lot of latex gloves that way. Visually impaired people can use a combination of sensory and relational methods for orientation, including traffic noise, the sound of other people’s footfalls, and even asking for directions. “But how do you give non-visual directions? They usually end up just leading the person. There’s a dignity of going on your own, of not having to rely on assistance.” Hmm… is that why men are so reluctant to ask for directions? Because people with visual impairments can’t always spot hazards from a distance, or detect when objects have been moved, consistent patterns and predictable environments are especially important for safety reasons. In fact, these features are helpful for sighted people in low-light conditions as well, especially if you’re bleary-eyed in the morning and looking for your toothbrush. The use of markers should include non-visual landmarks as well as visual ones. 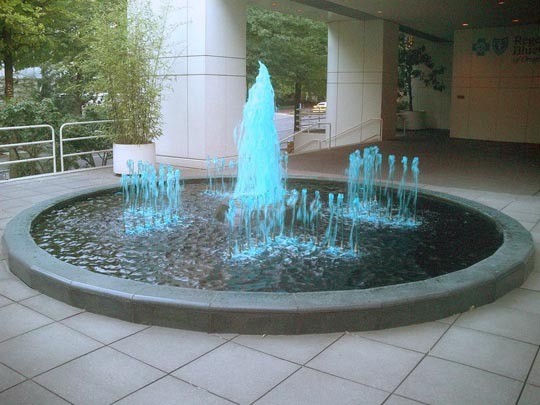 Fountains make good non-visual landmarks because you can hear them and feel the spray. This one would be hard for someone to fall into, because it has a generous raised rim. A building’s “handshake” consists of designated points of interaction where visitors touch or grip things, like railings or door handles. Downey didn’t go into this in depth due to time constraints, but we’ve all experienced doors or other features that looked really cool but were awkward or even impossible to use. Something more ergonomic that fits the hand and body easily can make this “handshake” a more pleasant experience. A building's "handshake" is literally that. Left shows the "hand-le", a design by Naomi Thellier de Poncheville. Middle shows a typical door handle one might find in a public building or office. Right shows the BioKnob by Tychi Systems, a biometric doorknob that reads the user's thumbprint. Acoustics are an important component of sight-free navigation. Although people aren’t quite as skilled as bats, changes in acoustics are quite noticeable and can serve as a reminder of location. Materials and finishes can be employed to change acoustics, and changes in floor coverings can serve as a tactile indicator when transitioning from one area to another. Hard surfaces on floors can also help with a cane, because the tapping can create echoes that serve to define the space. 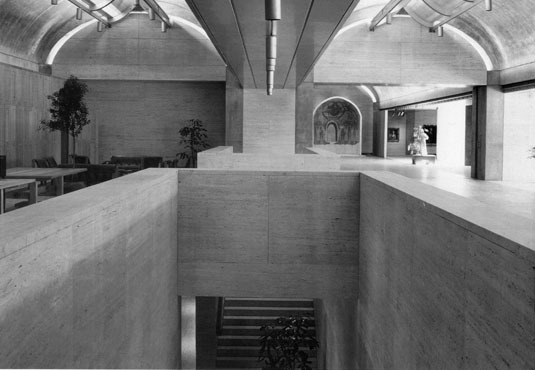 Louis Kahn's design for the Kimbell Art Museum did such a good a job on the acoustics that it's difficult to navigate using sound alone. Tactile strips for transit boarding platforms are by now a familiar sight in most major metropolitan areas. Downey notes that in places like the Mongomery Street BART station, there’s not enough textural differentiation between the tactile strips and the brick paving on the rest of the platform. We're all used to seeing tactile boarding strips like this one at train platforms and sidewalk crossings. In addition to providing extra traction, they also allow a blind person to detect the difference in texture and thus locate the edge. 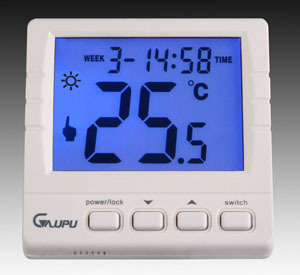 This programmable thermostat provides visual feedback, but a blind person would need audio feedback in order to know what temperature it's currently set to. Downey noted that up to one-third of our sense of balance comes from vision. People new to sight loss often have impaired balance as a result. “It was the first part of my rehabilitation training after losing my sight,” he noted. And, stairs are noticeably harder to navigate, especially going down, when you can’t see the edge of the treads. Tune in next week for a few follow-up questions that Mark English and I had for Mr. Downey. I worked with Chris when I first moved to San Francisco & I wouldn’t doubt for one second that he could change the face of architecture with his eyes closed. It’s wonderful to know he’s still projecting visions from his mind’s eye out into the physical world & very encouraging to learn that he’s on the forefront of this under-explored frontier in architecture. What a wonderfully inspiring article. Thank you for also expanding on the topic of architecture of the senses. WOW Chris, you sound amazing! My husband just lost his sight at 46 due to strokes and is NO WHERE near as positive and upbeat as your seem. That’s amazing that you have made a life around your vision loss. You are a true inspiration to all who is visually impaired. I am sighted and have a friend who was blinded at birth as a preemie from too much oxygen. We do fair housing testing together for Access Living. Recently, I’ve begun training as a tour guide for Frank Lloyd Wright houses. My friend could definitely handle the walk-through but how could the standard architectural tour be focused for people who are blind? Chris Downey talked about some of this in one of the articles (it’s a 2-part article). He relies on teamwork, computer voice prompts, and reads printed plans in Braille (yes, there’s a font for it). It’s not a simple fix, obviously. One person’s workaround might not work for you. Good luck. I’m wondering if you may be related to my grandmother. She was virtually blind from congenital cataracts as a child in Northern Ireland her name was Florence Downey. She was an inspiration to us!